This section provides illustrative views of urban pattern change from 2000 to 2010 focused on the north Dallas, Texas metro area (Collin and Denton counties). The McKinney, TX Urbanized Area (UA) in Collin County had the fastest growth rate among all Census 2010 486 UAs between 2000 and 2010. The McKinney UA population increased by 211 percent while the UA land area increased by 173 percent. Examine all Urbanized Areas using the UA interactive ranking table. See other geographies in context of urban/rural areas and changing patterns; illustrated in this section for school districts (McKinney ISD). See related views and demographics of the McKinney area in the application gallery at http://proximityone.com/gallery/guide/tx_mckinney.htm. Views shown in this section have been developed using the CV XE GIS tools and the Census Bureau TIGER/Line shapefiles. Use these resources to develop similar views/analyses for areas of interest. Examining this view reveals where Census 2010 urban areas exist that were not designated urban as of Census 2000. Note that the McKinney UA is not the same area as McKinney city. For example, portions of the places of Melissa and Princeton (among others) are included. The next graphic is similar to the above view except that the McKinney UA (green fill pattern) has been added. The next graphic is similar to View 1 with a zoom-in to Collin County. The next graphic is similar to View 2 with a zoom-in to Collin County. 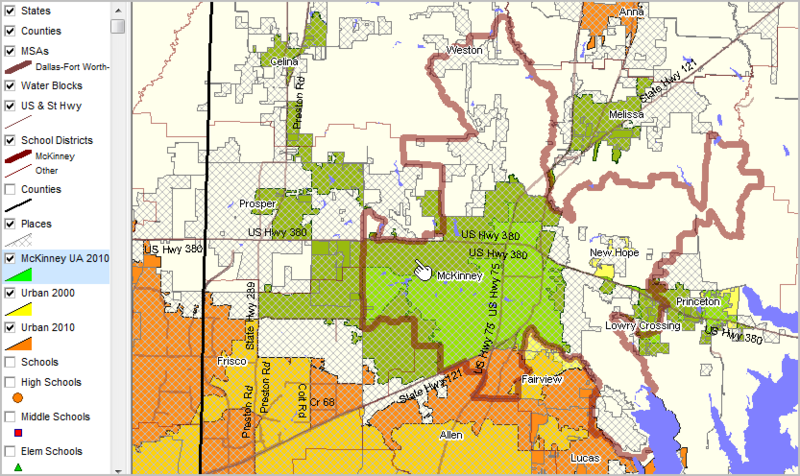 The Census 2010 McKinney UA (green fill pattern) layer is shown with partial transparency. The "see through" appearance enables viewing which parts of the Census 2010 UA are designated urban based on Census 2000 and which are designated urban based on Census 2010.